But, for one day we’d load up on the hand sanitizer and sunscreen, and go to the fair for a day of summer bliss. And by far, the best part was getting mini doughnuts. Delicious, miniature cake doughnuts, with a perfectly doughy texture, golden edges & coated in cinnamon sugar. Because what’s better than carnival mini doughnuts? Ummmm……. how about making your own bite sized version, just like you get at the fair, only they’re baked instead of fried, AND you don’t have the crazy high price tag or have to stand in line? Yes – these homemade mini cinnamon sugar doughnuts are all those things. They’re the perfect copycat recipe of those delicious mini doughnuts sold in white paper bags at fairs and carnivals, and you need to make them yourself. For the recipe, it’s really straight forward. First we’ll whisk the wet ingredients with the sugars, then add in our flour, baking soda & salt. Everything gets mixed together – bonus, there’s no electric mixer needed – then we’re ready for baking. Seriously, the batter comes together in under 10 minutes. Since these mini cinnamon sugar doughnuts are baked instead of fried, we’re using a mini doughnut pan. Even if your pan is non-stick I recommend spraying it with cooking spray so the doughnuts. The easiest way to fill your pan is to pour/spoon the batter into a ziploc bag, then cut off one of the bottom corners. Then pipe the batter into each mini doughnut cavity, filling each about 1/2 full. What makes these doughnuts so delicious is the soft, tender, and slightly doughy texture created by using buttermilk & sour cream in the batter. The other secret ingredient is adding nutmeg which gives you the classic doughnut taste. Don’t leave it out! Then for the final hurrah – the cinnamon sugar coating. 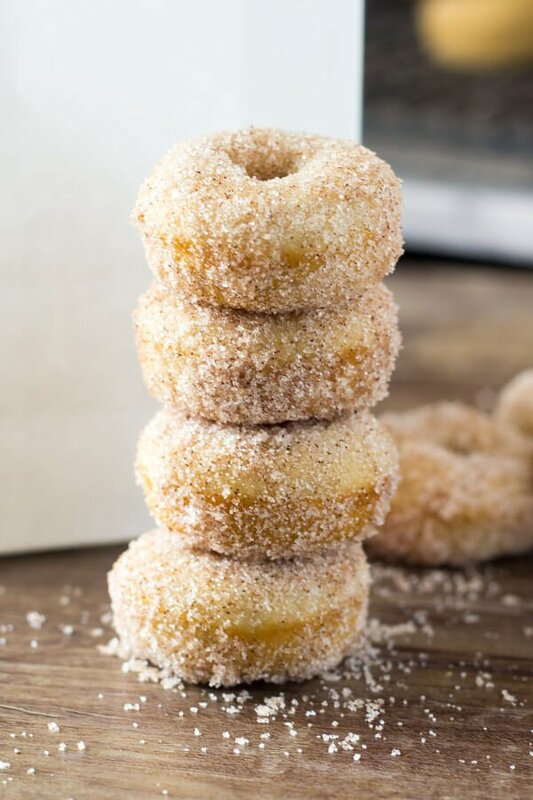 After our little doughnut friends are fully cool, we’ll brush both sides with melted butter (or dip them instead and shake off the excess if you don’t have a pastry brush), then roll both sides in our mixture of cinnamon sugar. The butter is key for that carnival mini doughnut taste. I highly encourage making these mini cinnamon sugar doughnuts, eating about 20, and celebrating summer. What’re your favorite summer treats? Mini Cinnamon Sugar Doughnuts just like the fair! With golden edges, a delicious coating of cinnamon sugar, and baked instead of fried - these are the PERFECT copycat recipe! 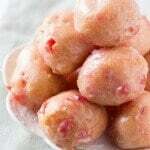 Preheat the oven to 350F degrees and spray a mini doughnut pan with non-stick cooking spray. You'll end up with about 30-36 mini doughnuts total, so you'll either need 3 pans or to bake them in batches. In a large bowl whisk together the flour, nutmeg, baking soda & salt & set aside. In a separate medium sized bowl whisk together the melted butter, sugars, egg & vanilla. Once combined and no sugar lumps remain whisk in the sour cream & buttermilk. Pour the wet ingredients into the dry and whisk until combined. Spoon the batter into a large ziploc bag, then seal the bag and cut one of the bottom corners off. Pipe the batter into the doughnut pan, filling each doughnut cavity about 1/2 full. You should end up with about 30-36 mini doughnuts total. Bake for 5-7 minutes, or until when you gently touch the top of the doughnut it springs back and feels slightly firm. Remove from the oven and allow to cool in the pan for 5-10 minutes, then remove the doughnuts from the pan and continue cooling on a wire rack. Once the doughnuts have cooled, in a small bowl stir together the sugar and cinnamon for the topping. Then setup your work space so that you have a small bowl with your melted butter, the bowl with your cinnamon sugar, a wire cooling rack (with paper towels underneath), and your pastry brush(if using). For each doughnut, brush both sides with melted butter shaking off any excess, then roll each side in the cinnamon sugar and place on the wire rack. Repeat until you've finished all of the doughnuts. If you don't have a pastry brush, you can dip each side of the doughnut in the melted butter and then shake off any excess. *Ensure all ingredients are at room temperature before getting started. **If you don't have a mini doughnut pan, these can be baked in a regular sized doughnut pan or muffin pan instead. For the regular sized doughnut pan, you'll end up with 6-8 doughnuts total and they'll bake for about 8-10 minutes. For the muffin pan, you'll end up with about 8-10 muffins and the bake time will be about 17-20 minutes. Yassssssss this looks wayyy too good. I love doughnuts with a passion and anything mini is definitely my favorite! Definitely agree with you on loving mini versions of desserts – Thanks for stopping by! I think my mouth is crying tears of joy. Well, okay. Maybe I’m just drooling. But SERIOUSLY, these look so stinking good! The perfect breakfast treat or indulgent snack!! Bahaha – “Mouth crying tears of joy” is my new favorite expression Karly! And yes, these are definitely my new favorite breakfast, snack, dessert…. supper…. I just made these this morning after eyeing them for weeks, they are absolutely wonderful! 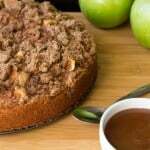 I’ve tried a few of your other recipes and you have not disappointed me yet. FYI if you made a book I would totally buy it, I have a book obsession and my shelf is just craving one with wonderful donut recipes ? Thanks so much Mariah! I’ll be sure to let you know if I ever write a book! Hey i am literally drooling over here just by reading the recipe but i have a issue, these donut pans are hard to come across here. I wanted to ask, can i just fry them? or will that ruin the recipe?